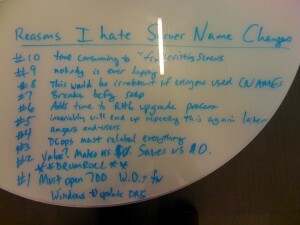 There’s been a, um, heated discussion at my work about our current server naming standards. Personally I hate our naming scheme. However, a lot of people have become accustomed to it, and a lot of applications use the standards in their configurations, often to automate management. So when the idea of changing it came up again this week, the O.C.D. part of me was anxious to “fix” our naming. Then I realized just what that meant. #2. Value? Makes us $0. Saves us $0. #1. Must open 700 WOs for Windows to update DNS (my team does not have DNS rights, so we must open a request and coordinate each change). If this doesn’t sound like a “make work” project, I don’t know what does.